I bought this book as part of a recent new book buying frenzy (see also The Curmudgeon’s Guide To Getting Ahead). I was eager to read this book after seeing it on the blogs and in the Wall Street Journal because it sort of tracked with an idea I had, oh, about twelve years ago. I remember distinctly walking into the foosball room at the start-up where I worked and explaining that, before we send men to Mars, we need to start littering Mars with things that those men can use in case of trouble. It was right about the time the mission with the rovers Spirit and Opportunity were launched, and I was probably reading some science fiction at the time. 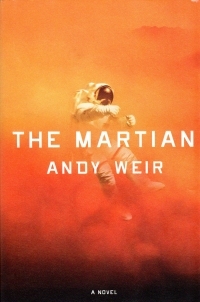 At any rate, this book details a single astronaut’s struggle to survive on Mars after a sudden sandstorm threatens the mission and his injury and apparent death cause his crew to leave him behind as they evacuate. He has only a habitat designed to house six people a limited number of days, two buggies, six potatoes, and his own ingenuity to make the best of his situation and hopefully hold out for some sort of rescue. The book is a little heavy on the science and the engineering of his predicaments and solutions, but the voice of the fellow keeps it moving along pretty well. Eventually, NASA discovers he’s still alive, and they get to communicate with him when he drives to the Mars Pathfinder and reclaims its radio–see how it meshed with my pre-foosball musings? So I really liked the book, although it could have been a touch shorter and some of the setbacks seem thrown in to lengthen the book or to pad it out. Of course, Mars is a hostile place–it’s not the kind of place to raise your kids–so I imagine the survival of the fellow is the improbable portion of the story. But it’s a good story.